11/29/2015 Sunday morningtime. Jicarilla just off of Warner-Elliot loop, Phoenix/Ahwatukee. This is a pic of the backyard/patio of the house on the SE corner. 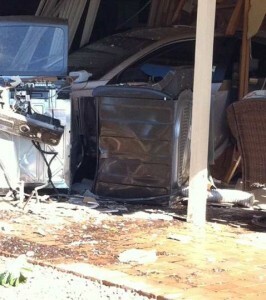 A correspondent writes: Reportedly motorist was eastbound on the Loop, made a right turn on to southbound Jicarilla, striking parked car along northbound Jicarilla, totaling the small car, then turning abruptly, crashing through attached garage (door was up with another parked in driveway) of house at southeast (south) corner of Jicarilla and the Loop. 15 1/2 year female with learner’s permit operating a dealer car with an older male passenger (maybe her father? ); she apparently hit the accelerator instead of the brake; apparently the male passenger had grabbed the steering wheel causing the abrupt turn. No reported injuries; a male was in the house at the time and female resident returned home before any emergency personnel arrived. This is very near the spot where another out-of-control driver inexplicably left the loop and drove up on the sidewalk, killing jogger Rene Karlin in 2011. For all the Ahwatukee shenanigans (more out-of-control drivers, killing busstops, light poles, knocking down walls and so forth), click on the ahwatukee tag.